With electronics playing a major part in all aspects of arable farming, the event gives Amazone the chance to showcase its range of AMABUS and ISOBUS controllers and discuss with customers, both existing and new, the merits of how adopting precision farming techniques with regard to spreading, spraying or drilling can radically improve their agribusinesses. The name AMABUS applies to AMAZONE implements that feature a job computer and which so far have been operated via AMATRON+. This is as oppose to ISOBUS implements and terminals that fulfil the ISO standard and which are also compatible with other non-AMAZONE implements meeting this standard. More than 30,000 AMATRON+ terminals are in use and now, with the switch over to AMATRON 3, the worlds of ISOBUS and AMABUS are bridged as AMATRON 3 is equally at home as an ISOBUS controller as well. AMATRON 3 also features a built-in Tractor ECU making it posssible to configure the coupling data and forward speed signal from a non-ISOBUS tractor without any additional expense. 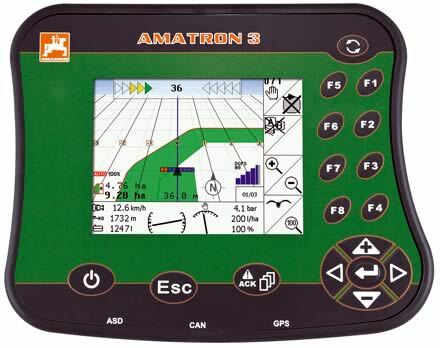 AMATRON 3 also offers the additional GPS functions of GPS-Switch, the automated headland part-width shut-off system for drills, spreaders and sprayers, GPS-Track parallel guidance aid and GPS-Maps, the application map software for site-specific part area application of fertiliser, sprays or seed. Amazone Ltd will take the opportunity to launch the new 8.4” touch screen CCI 100 terminal at the Precision Farming Event. Developed jointly by the CCI (Competence Centre ISOBUS), the CCI 100 terminal also offers the built-in Tractor ECU as well as TaskController-GEO and TaskController-SC with the licences CCI Control and CCI Command. Functionality is the same as AMATRON 3 with the added advantge of the bigger touch screen for added operator comfort. With the new ZA-TS spreader operating solely in ISOBUS and all Amazone sprayers being available in either AMABUS or ISOBUS, the demand for both AMATRON 3 and CCI 100 increases. Traceability is also increasingly being discussed and the introduction of ISO-XML as the file transfer format between controller and office makes the new TaskController software even more important with regard to documentation. That TaskController software is also now carried over onto AMABUS systems with non-ISOBUS AMATRON 3 now also being able to process ISO-XML files for export via a USB stick.